In his recent decision in the case of Ramos v. Jones, PICS Case No. 14-1051 (C.P. Northampton Co. June 18, 2014 Baratta, J. 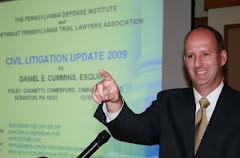 ), Judge Stephen G. Baratta of the Northampton County Court of Common Pleas granted a Defendant’s Motion for Partial Summary Judgment in a limited tort case and dismissed the Plaintiff’s claims for non-economic damages. According to a summary of the Opinion, the Plaintiff alleged severe, serious and disabling injuries from the accident including sprains and strains of her neck and back as well as injuries to her disc, shoulders, head, and right knee. She also alleged mental damages such as depression, fear, anxiety, and other emotional injuries. The Plaintiff additionally asserted that she was unable to pursue her usual occupation as a result of her injuries. In filing a Motion for Partial Summary Judgment, the Defendants asserted that the Plaintiff’s non-economic damages claims were barred by the Plaintiff’s limited tort selection. The court granted the Motion for Summary Judgment after indicating that the Plaintiff’s alleged injuries appeared to be soft tissue in nature. The court also found that the Plaintiff failed to show that these injuries resulted in any substantial interference with any body functions so as to permit a conclusion by the Court that the injuries were serious. The court also found that the Plaintiff failed to prevent objective medical evidence that any pain she experienced following the accident was a result of the accident. The court noted that the record contained references to long-standing pre-existing neck pain. In granting the Motion for Summary Judgment, the court also noted that the Plaintiff’s post-accident treatment was sporadic and not extensive. Given that the court found that no reasonable minds on a jury could differ that there was no serious impairment of a body function on the case presented, summary judgment on the pain and suffering claims was granted. Source: "Case Digests" Pennsylvania Law Weekly (July 8, 2014).